City of Kamloops has issued our build permit for our combination self storage and auto wash facility at 1500 Hugh Allan Drive. A fixed price construction contract has been awarded. The land is cleared, and construction has commenced! Nationwide is pleased to announce that the City of Kamloops has now granted us building and development permits for both our self storage facility and auto wash terminal to be built on our property at 1500 Hugh Allan Drive, Kamloops, BC (the Kamloops Property). Further to receiving our permits, we are pleased to report that we have now completed the assembly of our development team comprised of experienced industry leaders in project management (BTY Group), self-storage architecture, design and engineering (CTA Design Group), and self storage construction (Maple Reinders). Collectively this group has designed and/or constructed of over 30 modern self storage facilities. 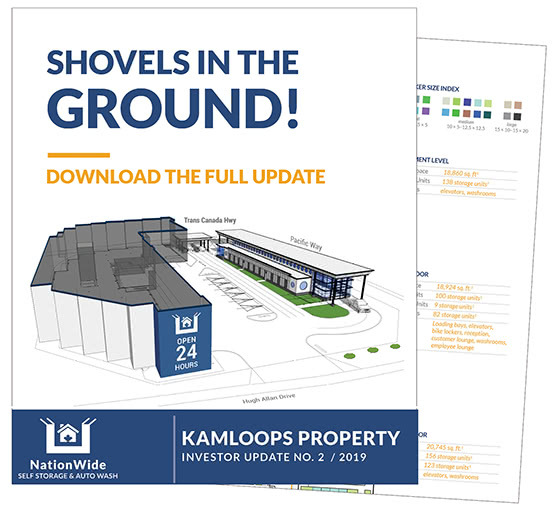 Download the full investor update to learn more about our upcoming Kamloops Property combination storage facility and auto wash terminal. Through a competitive bidding process managed by BTY Group, we have awarded a fixed-price construction contract to Maple Reinders Construction. Maple Reinders is commencing construction and estimates that the building will be completed in Q4 2019. With over 50 years of experience, Maple Reinders has been ranked as one of the Top 20 Contractors in Canada and as one of Canada’s Best Managed Companies. We are pleased to announce that we have launched a new Kamloops Property Overview page on our website where you will find all relevant project details, the latest investor updates and our latest architectural drawings and building pictures. Email info@nationwideselfstorage.ca to be added to our email list and be sure to add our email address to your contacts so you don’t miss an update. This information is general in nature and does not constitute an offer to sell or an advertisement, solicitation, or recommendation to buy securities. Nothing on these pages constitutes investment, legal or tax advice, nor was it prepared in consideration of the investment objectives, financial situation, particular needs of any specific recipient. There can be no assurance that investments will perform as or be of the quality anticipated. There are risks associated with any investment.